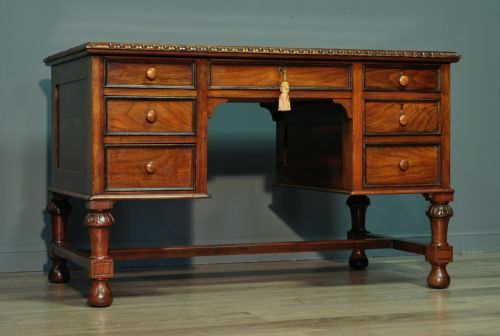 Attractive antique Victorian mahogany teachers/clerks desk. 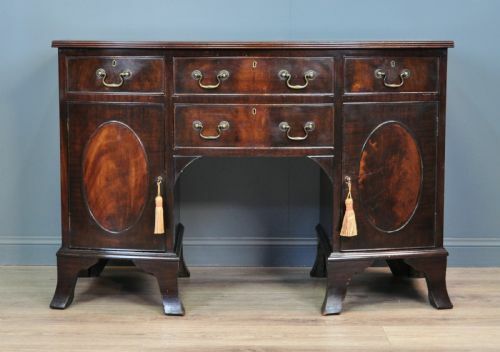 A lovely antique Victorian mahogany teachers/clerks desk. We date this desk to the second half of the 19th century. The desk sits on four long turned legs. The desk consists of a top writing surface which is rear hinged to allow access to the storage compartment beneath. The top surface features a red leatherette writing insert. The drop flap is fitted with a working lock (key supplied). There is a rear gallery to the top of the desk. The desk has an overall height of 48" (122cm), a width of 31" (79cm) and a depth of 27" (69cm). 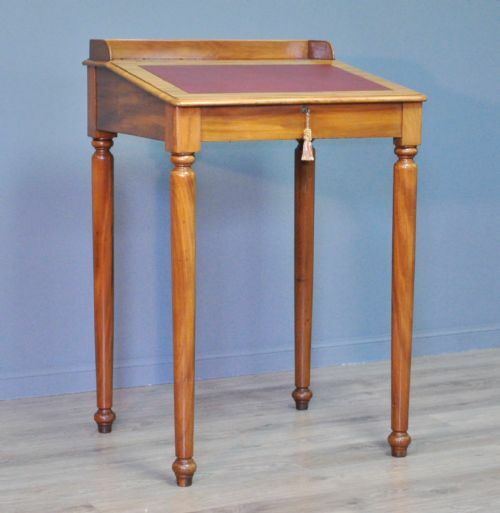 This lovely mahogany teachers desk remains in good solid condition with only minor surface markings commensurate with age and usage, including a number of minor usage marks to the finish. This remains a stylish and elegant teachers desk. It will continue to provide good service for many years to come. Attractive small antique mahogany twin pedestal writing desk / dressing table. A lovely mahogany desk. We date this desk to the early 20th century. The desk comes as a single piece unit. The desk sits on splayed bracket feet. 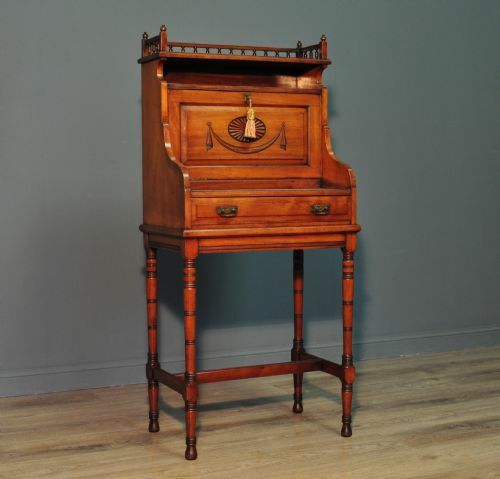 The desk has a pair of central kneehole drawers flanked by a single drawer over a cupboard to each side pedestal. The drawer fronts have been veneered with well matched finely figured mahogany. The drawers are fitted with attractive brass drop swan neck handles. The cupboard doors are fitted with locks which is operated by the supplied key. The drawers are also fitted with locks (no key is supplied but a suitable replacement should be easily obtainable). The left hand cupboard is fitted with a central shelf while the right hand cupboard is fitted with three linen press style drawers. The desk has a height of 30.5" (78cm), a width of 46" (116cm) and a depth of 21.5" (54cm). This lovely mahogany desk remains in a good solid condition with only very minor surface markings commensurate with age and usage. There are some light marks, scratches and indentations to the surfaces and the top surface of the desk has a few indented areas and some minor wear, there is a little bit of wear to the veneers on the front edge of the desk. This remains a very stylish and elegant mahogany twin pedestal desk ideal for a study etc. It will continue to provide sterling service for many years to come.